In this section, week after week, you will find facts, curiosities and insights at the limits of science fiction related to the principal challenges that people face in space. A challenge that deals with an absence, a void: the absence of weight, in fact. A challenge that is overcome with technology, with patience, with training, with teamwork and with the right nutrition. Breathe in …the Airway Monitoring Experiment. I remember clearly the long discussions we had when I worked as a lifeguard many years ago: should we give heart patients in need “nitroglycerine spray”? On the one hand, the nitro spray can provide fast relief to people suffering from heart conditions – on the other hand it can quickly drop a patient’s blood pressure, which should be avoided at all costs in an emergency. We decided against it – and we took the right decision. A nitroglycerin spray acts on nitric oxide which is produced by the human body itself and is a good indicator of airway inflammation: a higher amount of nitric oxide in exhaled air indicates an inflammation. How this works exactly and how air pressure and gravity-influenced blood flow can affect readings were researched in the complex “Airway Monitoring” experiment last Friday on the Space Station. ESA astronaut Samantha Cristoforetti and NASA astronaut Terry Virts had begun preparations for the experiment on Thursday. They brought the equipment into the Quest airlock, which is usually used as a door to the outside of the International Space Station. Barry Wilmore as Crew Medical Officer was also briefed to standby his colleagues during the experiment. After 91 days of living in their new home in space they finally went outside Not to catch some fresh air of course…that would be quit dangerous! 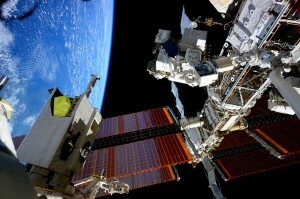 US astronauts Barry Wilmore and Terry Virts commenced the first of three spacewalks last Saturday. 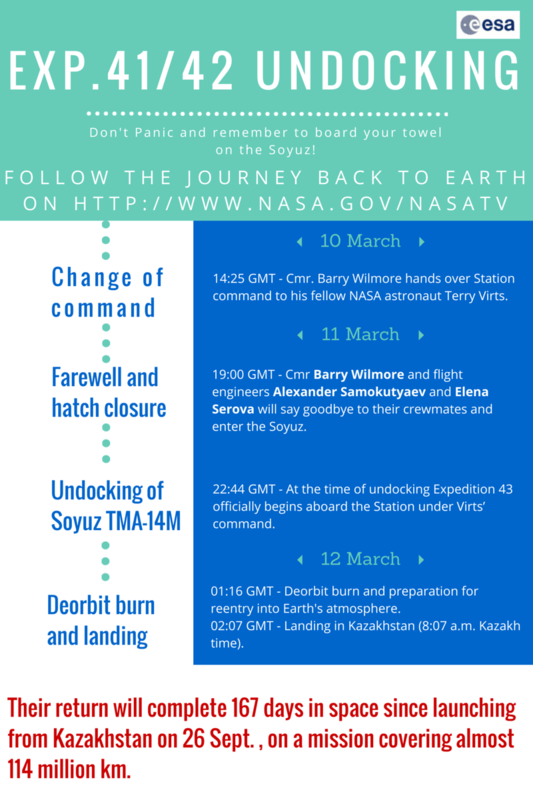 It was Barry’s second spacewalk after his first one last October and Terry’s first. The two astronauts, already nicknamed the ‘cable guys’ have to rig cables on the International Space Station for new docking ports for commercial and international spacecraft called International Docking Adapters or IDA. They will be delivered on two Space-X Dragon spacecraft in the near future. The adapters are built by Boeing and will arrive separately as Dragon cargo that will dock to the Harmony Module or Node 2. Node 2 already has two Pressurized Mating Adapter (PMA) which are used to connect spacecraft and modules with different docking mechanisms. They resemble tunnels that connect to spacecraft. The tasks for the U.S. spacewalks #29, #30, #31. The goal will then be to link each International Docking Adapters to a Pressurized Mating Adapter … imagine doing it with Lego, more or less! But like with Lego there is a possibility that one piece, in this case the Pressurized Mating Adapter could be better used elsewhere. That is the case with PMA-3. The first International Docking Adapter is relatively easy to install: it is connected to PMA-2, which is installed on the Harmony Module facing the direction the Space Station moves. The second International Docking Adapter requires more work. The international adapter will be connected to PMA-3 but it first has to be moved from Node 3 Harmony to Node 2 Unity to face towards space. Why all this work? The new docking adapters will be used to welcome the new commercial cargos from Space-X and Boeing , starting most likely from the last part of 2017. In the long run the two new Adapters will allow the Space Station to host one more crew from the present six. In the meantime new cargo arrived at the Space Station bringing food, supplies and new hardware for the experiments. It has been a busy period for the astronauts living on the ISS that in a very short period has seen the arrival of Dragon and the depart of both Dragon and the last ever European cargo spaceship ATV-5. Progress 58, the Russian cargo just arrived at the Station, will stay docked to the Station until next August. The astronauts have a lot of work to do in any case: two more spacewalks are expected this week and a new crew will soon arrive to start Expedition 43. Time for farewells!! The Dragon spacecraft left the International Space Station earlier this week and today ESA’s ATV spaceship with the catchy name Georges Lemaître detached from the Station and will plunge after several orbits into Earth’s atmosphere. Due to the enormous heat from friction caused by its deceleration through the upper layers of air layers the spacecraft will turn into a huge fireball – a fitting end to the spacecraft that is named after one of the founding fathers of the Big Bang theory! 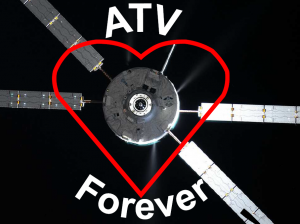 Unfortunately, this will be the last ATV – after five very successful missions, the project is now complete. At the Columbus Control Center (Col-CC) we provided for each flight the ground infrastructure and supplied our colleagues at ATV Control Centre in Toulouse, France, with data, video and voice connections to the International Space Station network. After ESA astronaut Samantha Cristoforetti and cosmonaut Alexander Samokutyaev closed the hatches of ATV yesterday, the Space Station was prepared for the last hours of undocking of ATVs. 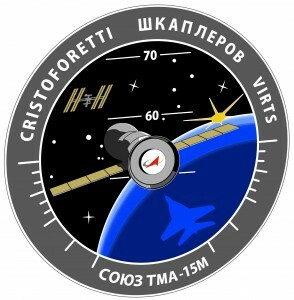 We turned off our little amateur radio station [http://www.ariss.org/] in Columbus as well as the external Rapidscat experiment [http://www.jpl.nasa.gov/missions/iss-rapidscat/], any radio interference with ATV’s navigation from the International Space Station should be avoided. Slowly the Space Station turned to an appropriate orientation for undocking. When the moment arrived the Space Station’s active position control was turned off completely: Georges Lemaître needs to push away from the Space Station without the mothership trying to compensate for this force. Afterwards all that remained was for the astronauts to wave good-bye … ATVs are part of a large space fleet that supplies the International Space Station. When the American Space Shuttle withdrew from service the Russian Soyuz spacecraft became the only way to get people to the Space Station and back on Earth. Three astronauts share a small space – and so there is little room for other supplies. Despite this there is enough transport capacity to supply the International Space Station with vital cargo: The Russian unmanned Progress cargo has been flying for years as well as the Japanese HTV and the European ATV. Relatively new in the family of cargo ferries are two unmanned American commercial vehicles: SpaceX’s Dragon and Orbital Science’s Cygnus. While the ATV and Progress ships fly to the International Space Station and dock on their own accord, the others need assistance from the Station’s robotic arm. They approach the Station and fly in formation together – not so easy with complex orbital mechanics to calculate – before being gently captured by the robotic arm and moved securely to a docking port. Only then can the astronauts enter and start unloading cargo. It is much more complicated to bring something from the International Space Station back to Earth. The ATV, HTV, Progress and Cygnus spacecraft have no heat shield or other systems that are needed to survive a reentry into Earth’s atmosphere: they are designed to burn up in the upper layers of the atmosphere of Earth. Because of this the astronauts load them full of trash from the International Space Station and they serve as cosmic garbage disposal. Aside from the manned Soyuz only the Dragon is designed to withstand the tremendous energy from decelerating at speeds of 23 faster than the speed of sound. Paradoxically it is more difficult to get things from the Space Station to Earth than vice versa. Cover image by ESA astronaut Samantha Cristoforetti: https://www.flickr.com/photos/astrosamantha/16546104212/ . After my bad experience interviewing fruit-flies, today my boss came to me saying I should interview someone who has been referred to as “elegant”… “And transparent,” she added with a smile. She’s a good boss, my boss is. I know she trusts me and that she values my work. The fruit-fly experience is now in the past. So I dutifully phoned the number the boss gave me and transcribed. Good morning professor, thanks for agreeing to this interview with Outpost 42! My pleasure, for my colleagues and myself it is a duty and a pleasure to make a small contribution to science and its outreach. You are very kind, professor. I know you will take care of an experiment to improve the health of astronauts on long-duration missions. What is it? Together with other colleagues, I work on the EPIGENETICS experiment: we try to understand how living in weightlessness can induce inheritable genetic modifications without changes in the DNA sequence. But DNA is genetic register is it not? If it does not change, it cannot transmit differences from past mutations. Am I wrong? Well, some changes that do not correspond to a changed DNA can be inherited. The DNA remains the same, but the way it is expressed changes. A simple comparison would be when different actors perform the same play. The script will remain the same, but its interpretation is different. The science that studies these kind of changes is called epigenetics. Aside from this example, where do you see such a mechanism in everyday life? A classic example is cell differentiation: some cells specialise, but do not change their basic DNA structure. Some recent studies suggest that epigenetic changes may also have an impact on aging and on tumors. Let’s go back to the astronauts and space. Why do you want to do this experiment in reduced gravity? We want to understand how a cell that has adapted to space can transmit its adaptation to the next generation of cells. Bones and muscles of astronauts undergo changes in long-duration missions: our experiment is aimed to better understand if there are changes at the level of each cell and what the link is between adaptation and mutation epigenetics. I’m curious to see how you conduct the experiment. In her blog Samantha Cristoforetti seems to be having a lot of fun with Epigenetics. It is because we are involved. Understandably so Professor, you and your colleagues are certainly charismatic people. What I meant to ask was with which organisms are you conducting the experiment? Please do not tell me that it is those arrogant fruit-flies! [laughs]. We do not need fruit flies, our involvement is enough. You and Samantha of course. I imagine that you follow our astronaut step by step from Earth as she deals with the organisms of study, are they bacteria? Look [he keeps laughing], there is a misunderstanding here. We are on the station together with Samantha. In what sense? In the only way possible. We are there with her: when we launched we were larvae. Then we awakened with a good bacterial nourishment: some of us were put in a centrifuge that simulates gravity while others were left free to float in zero-gravity. Once mature, we reproduced: the adults were taken away and put in the refrigerator (called MELFI) to be analysed on ground while the larvae continued eating and growing happily for five days. This process is repeated: adults are popped in the fridge and the second-generation larvae allowed to grow. And so on, for four generations… Why are you not saying anything? Have you lost interest? Professor … who you are you? I am a worm, of course. What? Worms? I’m talking on the phone with a worm? I am a Caenorhabditis elegans, in fact. I have the honour of being able to enjoy a certain elegance. Is it a problem? Think about it: we are just a millimetre long, and we are totally transparent, allowing researchers to observe our internal organs under a microscope easily. And we are almost all hermaphrodites. Hello? Hello? Anyone on the line? Mr. interviewer … we have to go, the MELFI awaits us: goodbye, then, we’ll tell Samantha you said “hi”! In the photo: astronaut Samantha Cristoforetti during an emergency simulation. Don’t panic is written in large letters across the Hitchiker’s guide to the galaxy in Douglas Adam’s novel of the same name. Don’t panic was also our motto yesterday in the Columbus Control Centre in Oberpfaffenhofen, Germany as well as in the International Space Station control centres in Houston, Moscow and Tsukuba, Japan. At 9:44 CET an emergency alarm was triggered on the International Space Station that implied ammonia from the external cooling circuit could have leaked into its interior. Following emergency protocol the astronauts quickly went to the Russian part of the Station as no ammonia is used for the cooling circuits in those modules. The astronauts could see from air measurements that they were perfectly safe in the Russian segment. From the start there was some doubt as to whether ammonia really was leaked but for safety the crew was told to stay in the Russian segment while the situation was analyzed in detail. The astronauts were fast to inform us that they were fine: Samantha tweeted to the world: “Thanks for your concern, we are all doing well!” In this type of emergency the external ammonia cooling circuit is quickly shut down and working pressure is reduced to prevent further inflow of toxic gas to the modules. Yesterday the ammonia loop B was shut down meaning half the cooling performance of the Space Station was no longer available. The Columbus Control Centre had to partially shut down the Columbus space laboratory to reduce heat production. While the astronauts waited for the call to reopen the hatch, the control centers were busy trying to get a first idea of what was happening and adapt the Station’s configuration to the new situation. While we were doing this experts were called in to find out why the emergency alarm sounded. In the afternoon we came to the conclusion that the reported measurements that triggered the alarm could not be trusted. Detailed analysis based on other measurements indicated a computer problem and not a real emergency scenario. In the evening the crew was given a “Go” to enter the American part of the Space Station wearing gas masks and take measurements – no ammonia was detected. At around 21:00 CET the astronauts opened the hatch and could sleep in the American part of the station. Although the danger was a false alarm the B Loop is still shut down – we do not want to rush things but bring the Station slowly back to full operations from its present configuration. The emergency has evolved into a scheduling problem for us as we try to readjust the schedule to make up for the lost time. In a way the situation happened at the best possible time. 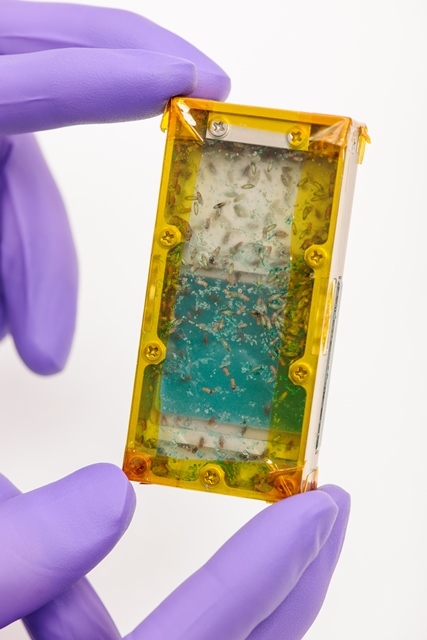 The astronauts were just about to set up experiments with living fruit flies and other biological experiments. These experiments would have failed if they had left them alone during their time in the Russian segment. ‘Luckily’ the alarm was triggered just before they started so the experiments will be able to run safely in the near future. The experiments and hardware in the Columbus laboratory seems to have survived the emergency power down as well. Tomorrow we think Samantha and Terry will be able to conduct the first session of the Airway Monitoring experiment as planned despite yesterday’s problems. The astronauts are ready to kick off their day! It does not sound that different from the morning routine of any other human being preparing for work on planet Earth, does it? The first official interaction with the Control Centers around the world is during the mDPC (“morning Daily Planning Conference”): Crew and the Flight Controllers tag-up on the daily operations, discuss deltas to the plan and address any crew question that might arise. The termination of the mDPC marks the start of the actual work-day for the crew. 6.5 hours of their day will be divided between conducting experiments, installing new payloads, executing repairs and “housekeeping”! In addition to the work time, 1 hour is always allocated for a midday meal, and 2.5 hours are strictly scheduled for physical exercise: crewmembers use a cycle ergometer (i.e. an exercise bike) for cardiovascular exercise, a treadmill for cardiovascular exercise – loading the skeletal system and maintaining the neuromuscular patterns for locomotion, and a Resistance Exercise Device for maintaining muscles and bones. Once the daily activities are completed, it is time for the eDPC (“evening Daily Planning Conference”). This is “goodnight” time: interactions with the crew on the Space-to-Ground voice channels are interrupted to allow them some well-deserved rest time, we also switch off any camera inside the space station! Only in case of contingency scenarios the Ground Teams would make contact again. After a round call to all control centers for any input, crew is off-duty: they can have dinner, check social media and watch TV or movies, or spend some “quality-time” sightseeing from Cupola. Should you be interested in the current OSTPV: We give you a little bit of insight here. The Hitchhiker’s Guide to the Galaxy, as it is known, is the most successful book ever published by the publishing houses of Ursa Minor. A worthy competitor is 53 other things to do in zero gravity. Of the latter work, however, neither the author nor the content are known. At least they were not known until today. A group of researchers from Outpost 42, in collaboration with the Antiques Academy of the Near and Remote Future argue, in fact, that they have found excerpts of the original 53 Other Things to do in zero gravity. What makes the originality of this discovery very questionable is that the name of the authors appear next to each sentence. Rather suspicious names: take a look at the section of Outpost 42 crew. In any case, here are the 23 fragments that were discovered. Never put your feet on the ground. Never ask yourself: what shoes should I wear today? Play around with a strawberry trying to catch it with your mouth without fear of dropping it on the floor. Storing things in the highest cabinet without the help of a stick to reach it. Never worry about using a hammer and nails: just a little velcro will do fine! Never make your bed in the morning. Rotate your home so that friends can easily find the entrance. Use a bicycle without a saddle. Throw the scales away: they always show zero! Hold things with your legs while you walk with your hands. Eat a lot without gaining weight. Cook without fear of making the floor dirty … nothing falls on the ground! Freefall and laugh about it. Be heavy and fly all the same.